MetOp-A; Why this unusual solar panel shape and deployment method? This solar panel is closer to square than most solar panels I've seen, which tend to be very long - length/width ratio perhaps 4 to 6. This looks like only 1.5, and it seems to be located at the end of a long arm. To me this is an unusual configuration - is there something specific about MetOp-A, B, C's operations that require this? below: Screen shot from 2017-April-19 BBC article about space junk. 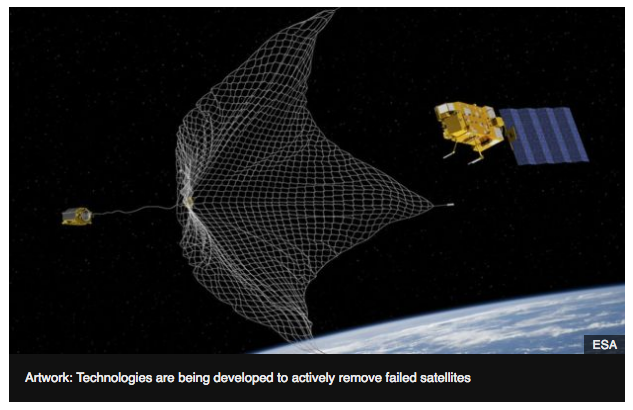 Presumably this was a random satellite chosen by the author, and does not suggest the configuration is to make it easier to "catch in a big net"! below: from Gunter's Space Page (Astrium). below: Astrium Polar Platform (PPF) from Gunter's Space Page. Once MetOp is in the correct position the solar array, which is on the zenith side of the satellite, is gently deployed to face the Sun. This procedure takes up to 17 minutes and happens in two stages. Initially, the solar array arm rotates 120° up and over. Then the large eight-section panel opens out to face the Sun. below: MetOp-A, including folded solar panel on deployment arm, from here. According to Wikipedia MetOp-A is in a sun-synchronous polar orbit with an altitude of 817 km and a local time of ascending node 21:30. I think this means it is always in sunlight, looking down at (roughly speaking) either 9:30AM or 9:30PM local time on the surface. 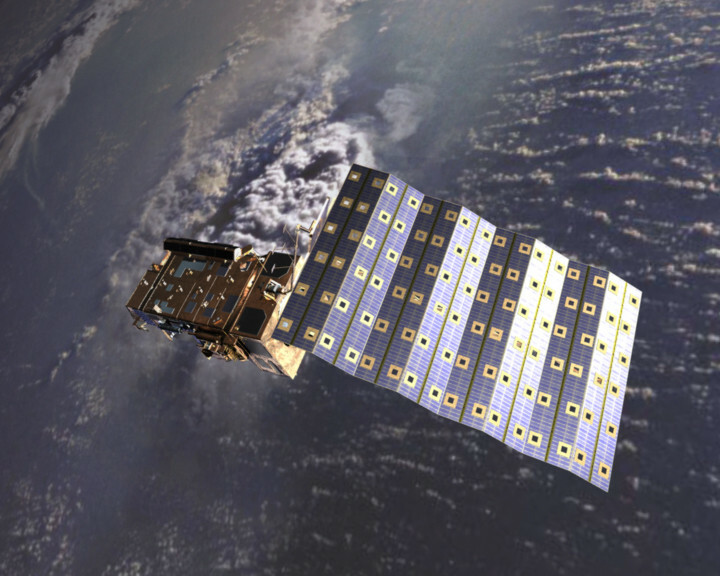 The main difference between a communications satellite and METOP is the aspect angle towards the sun, and the way it changes. Remember, for your solar arry (SA) to give you max power, it needs to be at right angles to the sun as much as possible; and also remember that both types of spacecraft (SC) rotate to keep always the same side pointing towards the earth. For a comm sat the SA extends north-south, and the sun moves from east to west. The SA counter-rotates around the nort-south axis to keep the sun at right angles. Due to orbit height and the inclination of the earth axis the SA is in sunlight most of the time, except about 3 weeks either side of spring and fall equinox. Due to the earth axis inclination the sun moves north-south on a seasonal basis, but the resulting mispointing is tolerable and needs no compensation. For Metop, which is in a polar orbit, the sun "rises" in the north when METOP is passing over the south pole and settles in the south when passing over the north pole (it is at the equator at 21:30 local, the ascending node, and moving south). The sun always shines from the left side, with a more or less constant angle of about 40 degrees (wrt the SC body), so the SA is mounted in such a way that the sun is always at right angles to its surface, and it rotates around the east-west axis to compensate for the moving sun. Also remember that METOP is flying "sideways" as can be seen from the video attached to the question. One of the reasons for the SA being squarish is the fact that there is only one on one side of the SC, and therefore the disturbing forces comming from the SA acting asymetrical on the SC, keeping the array short minimizes this effect. 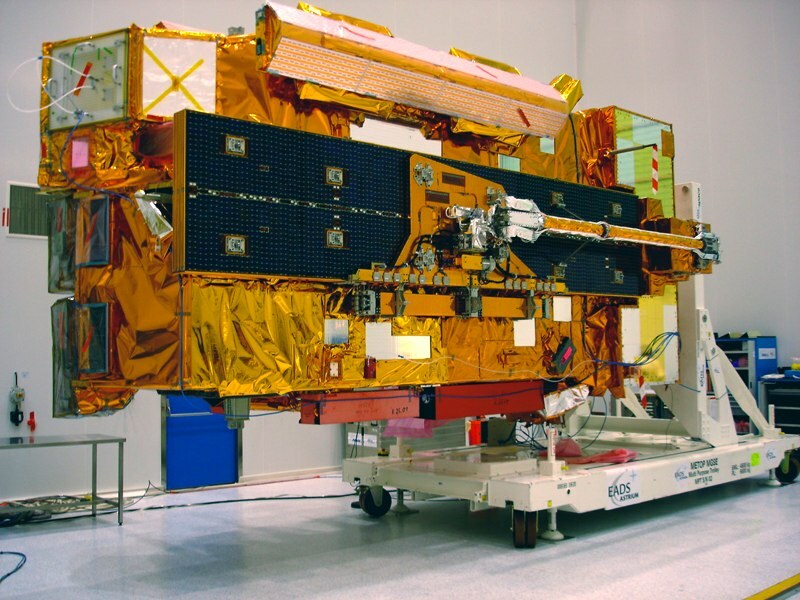 The attachement could be designed differently, but function drives form, and this is a tried and tested design going back to the late 1980, the French SPOT platforms used it, ESA's ERS satellites used it, ESA's ENVISAT used it and now the METOP platforms. Btw, METOP is tall (from memory, something like 6 meter) as well, when on the launcher, the interface ring is on the side of the SA! I hope this clarifies the points mentioned in the comments to the question and the previous answer. There's no single reason why the array stowage and deployment is so complex, but you have a SPOT heritage platform (the smaller cube where the Solar Array is physically attached) and the Envisat heritage payload module (the longer bit where the array is stowed). The satellite must also fit inside a launcher fairing (typically taller than it is wide), so the array must stow on one of the 4 longer sides. One of the shorter sides is taken up by the launcher interface ring, and the other is where the fairing will taper. For Metop-SG, the satellite body is sideways compared to the first generation, so the array deployment is much simpler - it just pops out of the side. Not the answer you're looking for? Browse other questions tagged design solar-power esa or ask your own question. Why satellite’s solar panel wattage is often listed in specifications?